We’d love your help. 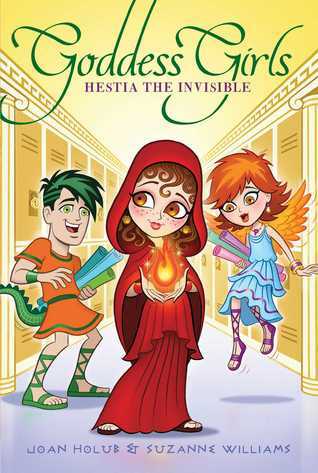 Let us know what’s wrong with this preview of Hestia the Invisible by Joan Holub. Hestia, the sweet goddess of the hearth, loves to cook, but is too shy to share her passion with other students. Her famous yambrosia salad is a MOA favorite-but no one has any idea that it was her recipe! When she has to pick a symbol that represents her highest self for a Service to Humankind contest, her classmates laugh at her first choice of an ordinary cooking pot. After initial embarrassment, Hestia becomes determined to break out of her shell and stop feeling so invisible around everyone at MOA. With the help of Pheme and a lizard-tail boy named Asca, she begins to see that she has much to offer to others. But will her quest not show her best self after all? To ask other readers questions about Hestia the Invisible, please sign up. Kate Ybanez asca apparently, i never read it yet...but its definitely him since he was part of the book cover and was also mentioned in the preview. After so many disappointing books in these series, Holub and Williams are finally bringing their old flair back! I kept grinning like an idiot as I read this, it was just so refreshing to read a goddess girl book that reminded me of why I loved these series in the first place. After multiple disappointing books, I was just about ready to give up on this series all together. But then, something compelled me to give this one a chance.... and I'm glad I did, because it was awesome! So far we'v After so many disappointing books in these series, Holub and Williams are finally bringing their old flair back! So far we've met different types of main characters in the other books: popular goddesses, mean ones, one who gossip too much (I'm looking at you Pheme), and even a nosy mortal. We've seen goddess who can cast rainbows, and even a mermaid at some point. The main character wasn't as 'unique'. She seemed quite ordinary, even invisible on the outside. But this goddess wasn't the least bit boring on the inside. She was the goddess of the hearth, and could produce fire by slapping her handa together. I loved Hestia. She was a loner, a very shy type (don't think I've seen a shy goddess yet). Her best friends were the lunch ladies. They were her comrades when the other kids barely acknowledged her. Of all the lunch ladies, Ms. Xena was her favorite. Ms. Xena had pretty much rescued her from loneliness when Hestia had started school at Mount Olympus Academy back in third grade. Being a loner has it's perks, but it also means you're, well, lonely. Hestia was tired of being invisible and wanted to make some friends for a change! Watching her try to figure out the *secret of making friendships* was a joy to read, and so relatable. Yes, I think that's what I loved most about this book. When she’d first come to MOA, she had searched her pale pink Goddessgirl Guide scroll for advice on making friends. But there was no chapter on that. Too bad there wasn’t a Friendship Guide scroll she could consult to answer her most perplexing questions. Like, how many times do you need to talk to someone to call them a friend? Five times? Ten? Twenty? A hundred? That was a lot of talking for someone as shy as she was. And maybe it wasn’t enough just to talk. Maybe you had to do stuff together too. Like going to get shakes at the Supernatural Market. Or shopping together at the Immortal Marketplace. She’d done these things before, but usually by herself. Because she’d always been too shy to ask anyone along. What if they said no? She’d be crushed! 1. Sit with someone new at lunch. 2. Stand up for someone. 3. Talk to a boy. 4. Try something I’d normally say no to. 5. Take a truly big, bold cooking risk! She does complete her list and made quite a few friends akong the way. This was a short novel, and it's writing was simple but to the point. But watching Hestia grow as a character and slowly change before my eyes was the best part of the book! Cheesy & girly, but great mythology none-the-less. I liked this story a lot. I finish this at school and really enjoy it. I LOVE Hestia she is my favorite and I cant wait to read this. I might dies from curiosity. Cute but some problematic moments. Hestia is the Goddess of the Hearth. After a quick prologue where she brings the idea of centralized hearth-fires to humanity, she is whisked off to MOA. Skip ahead a bunch and we see Hestia feeling mostly invisible at school; doing her best to hide at the back of classes, not be noticed, and skipping off to help the two lunch ladies in the cafeteria any time she can because cooking is her favorite. When a contest for a new Service to Humanity Award is launched Cute but some problematic moments. Hestia is the Goddess of the Hearth. After a quick prologue where she brings the idea of centralized hearth-fires to humanity, she is whisked off to MOA. Skip ahead a bunch and we see Hestia feeling mostly invisible at school; doing her best to hide at the back of classes, not be noticed, and skipping off to help the two lunch ladies in the cafeteria any time she can because cooking is her favorite. When a contest for a new Service to Humanity Award is launched for the godboys and godgirls of MOA; Hestia shyly begins working on her iconic "symbol" but can only think of a cooking pot. With the help of new friends, some prophecy, setting a list of goals, and her own determination to be different, Hestia works out a new symbol, talks to a boy, and even takes some cooking risks! Meet the goddess you never noticed before! Hestia, a very shy and sweet goddess, prefers to help the Lunch Ladies in the kitchen and avoids her class mates. But when there's an award about service to humankind, Hestia tries to change her reputation. Will Hestia develop her fiery side and make new friends? Hestia is my favorite goddess in the series because she is such a sweet character and finds her true self. It was a pleasant book, full of cooking and kitchen fun. She gets the lizard boy Asca Meet the goddess you never noticed before! Hestia, a very shy and sweet goddess, prefers to help the Lunch Ladies in the kitchen and avoids her class mates. But when there's an award about service to humankind, Hestia tries to change her reputation. Will Hestia develop her fiery side and make new friends? Part of the Goddess Girls series, this book focus on the "minor" goddess Hestia. This was one of my favorites out of the books I've read in the series. Hestia's skills and problems seem more real than some of the other "goddessgirls." I felt that I could relate more to her perspective than that of many others. The story was enjoyable and I can see myself re-reading it. On my re-reading it, I notice some more subtle "morals" towards the end. The story touches on the idea of being happy for others, Part of the Goddess Girls series, this book focus on the "minor" goddess Hestia. This was one of my favorites out of the books I've read in the series. Hestia's skills and problems seem more real than some of the other "goddessgirls." I felt that I could relate more to her perspective than that of many others. The story was enjoyable and I can see myself re-reading it. I read this to my 7-year old daughter. A fun book that puts a modern-ish spin on Greek mythology, this book came at just the right time for us. My daughter is getting interested in cooking and Hestia just happens to be the goddess of the hearth whose special talent is cooking. Hestia's personality and struggles also were good foddor for discussion amply suited to my daughter and her current needs. i like hestia of all the goddessgirls cause i love fire and i wish i could make fire too. hestia got me a little upsessed with her because she is really pretty and i wish i could make fire and now that i am goodreading about her i feel verey jeolous now but this was the best book in the goddessgirls series in my opinion.kaytee kaytee kaytee then kaytees mean i loved it very much i would die for it maybe. The popularity of this series seems to be dying off as the authors explore less well known gods and goddesses from mythology. Most students will not know Hestia and that is the way she prefers, at least at first in this book. Quite interesting... really wanted to get to the end to finish the book. These were my favorite books when I was younger. I still read them from time to time. They are very funny and creative. Second best goddess girl book! I myself like cooking too, so I know how Hestia feels. TOOL SCHOOL; MIGHTY DADS (a NY Times bestseller); LITTLE RED WRITING; the GODDESS GIRLS series (with Suzanne Williams); THIS LITTLE PRESIDENT, A Presidential Primer; THIS LITTLE TRAILBLAZER, A Girl Power Primer, ZERO THE HERO. Lucky to be doing what I love!